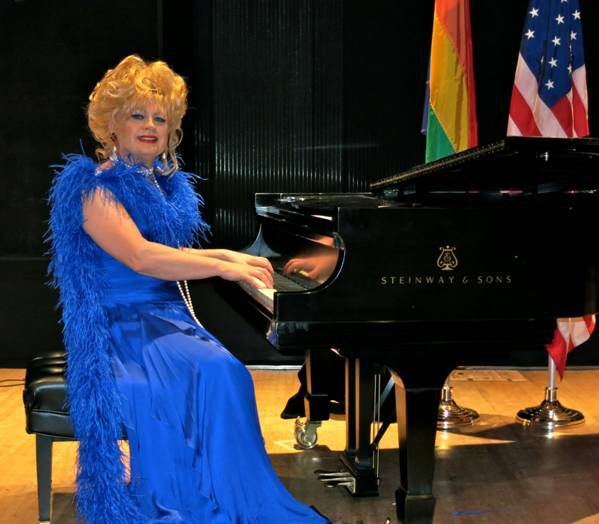 Jacqueline Jonée bills herself as “the World’s Première Concert Pianist Drag Diva,” which is PR hyperbole, but not by much judging from her display of musical talents in her concert at the Library of Performing Arts’ Dorothy and Lewis B. Cullman Center at Lincoln Center. Certainly Jonée displayed more than a bit of Liberace pianistic gifts in her amusingly over-the-top presentation. 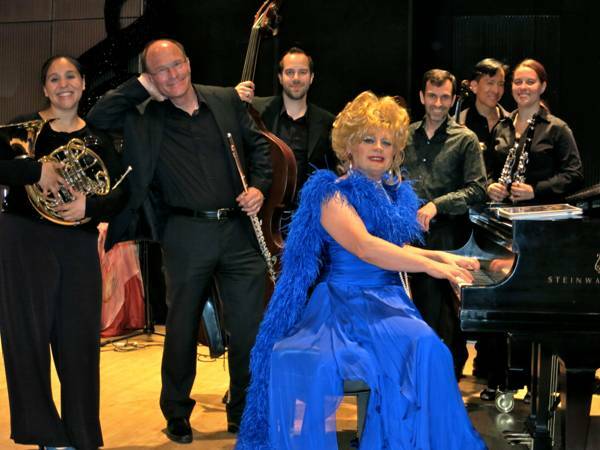 Her piano playing is deft and witty and her gowns and wigs are lusciously elegant. Her six-member band, the JouJou Jacquettes Philharmonic Orchestra, adds a touch of class to a repertoire that veers between musical theater and classical pieces. That she is not more famous is puzzling. She is a skilled entertainer who balances heart tugging shtick with an acid wit. Jacqueline Jonée Vidéo Verité at the Bruno Walter Auditorium attracted a large audience of devotees who sat, rapt, through the video presentation that preceded the live concert. The video interspersed rapturous audience commentary with long excerpts of concert performances from previous years. In a procession of gowns, Ms. Jonée performed everything from “Chopsticks” to “The Flight of the Bumblebee” with stops at Sondheim and Irving Berlin, all the while quipping humorously on Liberace’s legal problems and striking ballet positions at the piano as she played “Les Sylphides.” There were also hilarious bits with a page turner who couldn’t read music and a story of being voted the Pride Queen of the SAGE Senior Center! 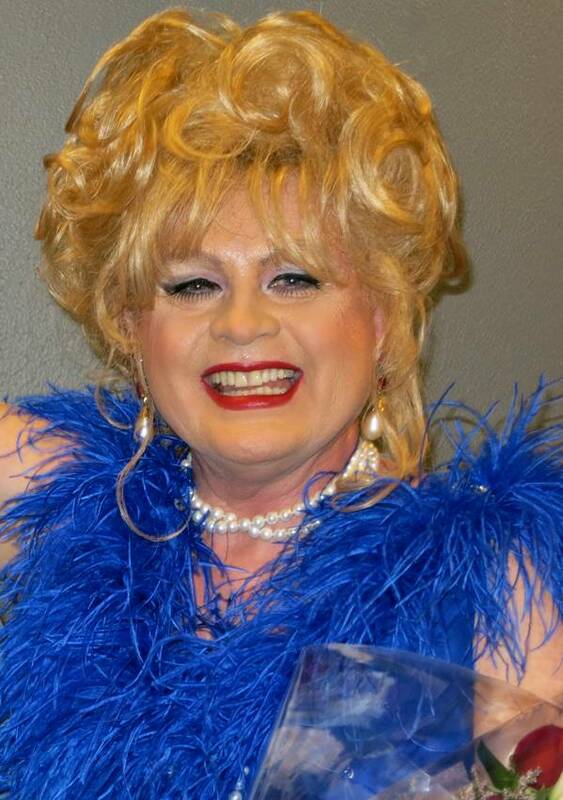 Of course, Jerry Herman’s gay anthem, “I Am What I Am,” had to make an appearance, here combined with a touching “Over the Rainbow” (Arlen/Harburg), both songs perfect for the Library’s celebration of LGBT Pride Month. The JouJou Jacquettes Philharmonic Orchestra consisted of Dr. Bjorn Berkhout on cello, Cat Cantrell on woodwinds, Simon Dratfield on flute, Audrey Flores on French horn, Sam Nedel on contra bass and James Tsao on violin. 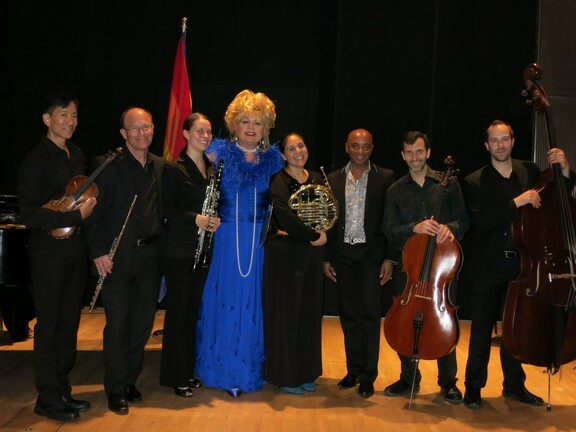 It was amazing how this small ensemble produced such a rich array of timbres and colors which enhanced Jacqueline’s consummate musicianship and showmanship.